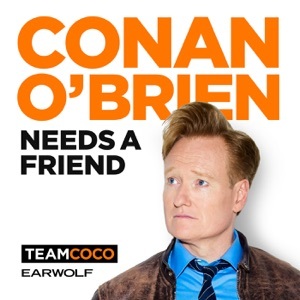 Writer and humorist David Sedaris feels apprehensive about being Conan O’Brien’s friend. David sits down with Conan this week to talk about the perks of having a colonoscopy, backhanded compliments, being honest about your family, and how to dispose of old tumors. Plus, Conan and his assistant Sona respond to a listener voicemail regarding a wax museum conspiracy.Got a question for Conan? Call our voicemail: (323) 451-2821.For Conan videos, tour dates and more visit TeamCoco.com.This episode is sponsored by Athletic Greens (www.athleticgreens.com/conan), Kendra Scott (www.kendrascott.com code: CONAN), ButcherBox (www.butcherbox.com/CONAN), Campaign Monitor (www.campaignmonitor.com/CONAN), Fracture (www.fractureme.com/CONAN), Hair Club (www.hairclub.com/CONAN), Mizzle+Main (www.comfortable.af code: CONAN), and Capterra (www.capterra.com/CONAN).